The Chamber of Commerce float. Photo: San Clemente Historical Society.San Clemente’s Fiesta celebration began in 1954 when Jennie Belle Bartlett wrote “La Cristianita”, a pageant depicting the baptism of two Indian girls, and the community theater group decided to enact it. 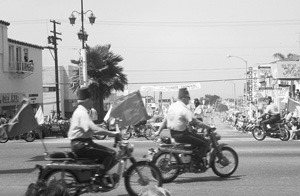 The San Clemente Chamber of Commerce sponsored the event along with a parade. Civic and church organizations joined in the effort and the Fiesta was held May 15 and 16 of that year. Maxine Beasley, a long-time San Clemente Resident remembers, “We got the whole town involved. Everyone wore costumes all week. I played an old Indian mother in the pageant, which was the major highlight of the Fiesta. We did that for several years”. 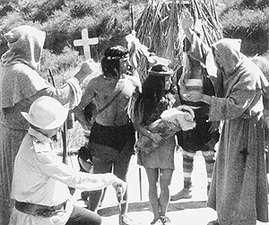 The pageant of La Cristianita commemorated the first baptism in California in a secluded glen on the outskirts of what is now San Clemente. Two critically ill Indian girls were found by a party of Spanish explorers and missionaries on July 22, 1769. The mother of the two girls was finally convinced to allow the missionaries to baptize them. The 1954 production was directed by Tom Gilmore of Laguna Beach. Franciscan robes were used as costumes. It was preformed open-air on the lawn of the clubhouse at 7pm on Saturday and 4pm on Sunday. The Kiwanis put on a pancake breakfast at Calafia State Park. Seven hundred people were served in two days at the first pancake breakfast which cost $.75 for hot cakes, orange juice and coffee. Another major event in the first Fiesta was the Saturday morning parade, which started in Plaza Park, (now Max Berg Plaza Park) moved down the west half of El Camino Real, then down Avenida Del Mar and ended at the clubhouse. Grand Marshall for the parade that year was Lt. Col Francis Agustine, who rode with silver mount on his horse Comet. (The silver was valued at $5,000). Also riding with silver mount was Harold Dakin on Miss Topper. This horse had been in President Eisenhower’s Inauguration Day Parade in Washington, D.C.
Other entrants in the parade were bands, floats, antique autos, majorettes and a band of Indians led by Chief Clarence Lobo of San Juan Capistrano. The parade had television coverage by United Press film. (United Press International). Special guests for the two-day event were Robert Cummings, television and movie actor Mr. and Mrs. Jim Jordan (Fibber McGee and Molly). Fiesta Queen Stephanie Stier presided over the activities. La Cristianita Pageant. Photo: Dorothy Fuller.Food and game booths filled the clubhouse lawn, a piñata party entertained the children and there was a Saturday night dance at the old Casino. In 1955, the Fiesta was held July 30 and 31. The parade had 155 units and more than 1000 participants. Twenty-one booths topped with palm fronds lined the community center lawn creating a miniature Olvera Street. The Saturday night dance moved to the tennis courts by the clubhouse (now the parking lot). Contests were held for the best Spanish costumes, best whiskers and sideburns, as well as awards for the parade entries. Raffle prizes included a television set, a Las Vegas trip for two and a Shetland pony. The Fiesta events continued each year with few changes. A 1970 Chamber of Commerce booklet states, “The community celebrated with dory races at the pier, the La Cristianita Pageant in Cabrillo Playhouse, band concerts at Plaza Park and a trophy parade that draws statewide entrants, motorcycle units, military drill units, drum and bugle corps and show horses. The 1969 Fiesta was dedicated to the City’s most famous resident, President Nixon”. The carnival booths eventually moved to Plaza Park and the parade reversed directions. The last parade was in 1988. Carnivals continued through 1985. 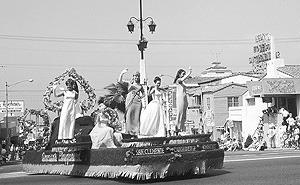 The Miss San Clemente float. Photo: Ralph Klassen.A 5K Race was added in 1988 and discontinued in 2003.